Jeremy Roenick wants you to be the next NHL Legend. So you like NHL games do you? Well if you do then let’s not call the whole thing off because chances are you are excited about the new features and new video for NHL ’12. According to EA this year marks the first time players will face dynamic goalies in the game. Players can knock the net off and make contact with goalies, knocking them down or out of position, as they crash the crease. Watch as goalies battle through screens to make awe-inspiring saves. Additionally, we’re reigniting the beloved fighting engine that first appeared in NHL 10 with all-new goalie battles. When the action gets heated, send a message by leaving the net, dropping the gloves, and trading punches with rivals during fights. You can play your way to superstardom in the revamped Be a Pro mode and experience the authentic action and energy of real life hockey with the Full Contact Physics Engine. 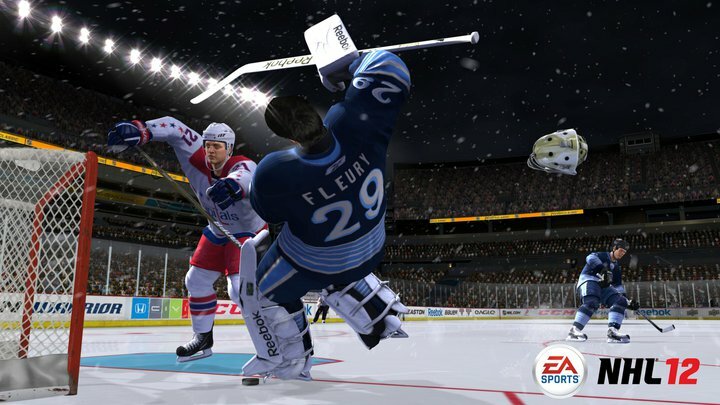 The NHL 12 Full Contact Physics Engine puts you in the rink with everything now live on the ice, from players to the environment – everything is interactive and in play. Experience the skill and aggression of hockey from shattered glass to flying helmets to knocking players over the boards and into the bench; crash the crease too hard and you’ll knock the net off and send the goalie flying. Size and physicality will be emphasized as bigger players will be able to throw their weight around as they screen the goalie and battle in front of the net. All new gameplay presentation is said to create an authentic, fresh new look and feel throughout NHL 12 with presentation graphics that mimic real life hockey broadcasts. For the first time ever lace up outdoors under the lights in one of the biggest hockey events of the season, the 2011 NHL Winter Classic® at Heinz Field in Pittsburgh, within seconds of putting in the disc. Inspired by the NHL GameCenter Ice Tracker, the all-new EA SPORTS Action Tracker simulates action without missing a beat with a shift-by-shift breakdown of stats and key moments leading up to your next shift. NHL 12 is in development at EA Canada in Vancouver which means that this title has been lovingly crafted by my fellow countrymen who, by the way, are fairly knowledgeable when it comes to the sport. Electronic Arts recently announced that a Madden title would be available for the highly anticipated Nintendo 3DS and be the first EA SPORTS title for the 3DS. According to EA, Madden NFL Football will offer a comprehensive handheld experience with exciting modes, such as authentic 11-on-11 football, fast-paced 5-on-5 action and Season Mode. Additional features jump off the screen with 3D graphics, such as “Spotlight Moments” and “Call Your Shots”. Utilizing the remarkable power of the Nintendo 3DS Touch Screen, “Call Your Shots” allows users to draw their own plays, on-the-fly, directly on the screen. While Madden NFL is NOT Madden 11, the game will still look and feel like Madden 11 with three types of play calling—GameFlow, Classic, and Arcade—Madden NFL Football provides an enjoyable experience for gamers of all skill levels.